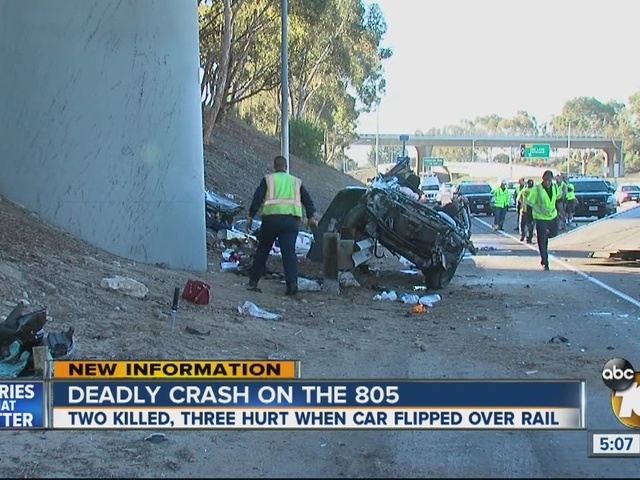 The medical examiner Sunday released full and partial identities of two married people who were killed, and three of their passengers who were severely injured, in a solo rollover crash on northbound Interstate 805 between Market Street and the Martin Luther King Jr. (94) Freeway. A 23-year-old married Hispanic man from Las Vegas was identified as the front-seat passenger in the 2011 silver Nissan Versa driven by his wife, the medical examiner said. Both were pronounced dead at the scene. Three other passengers in the Versa were identified by the medical examiner as 34-year-old Maria Miranda-Haro, 29-year-old Lucero Vazquez and an unidentified 16-year-old juvenile, all of San Diego. They were hospitalized with what officials described as life-threatening or major injuries. "Alcohol may have been a factor in the crash," CHP Sgt. Dan Kyle said about the crash, reported at 6:07 a.m.
"The Versa traveling northbound at approximately 65 mph drifted to the right off the road and into the dirt," Kyle said. "It continued north and eventually struck a metal and wood guardrail. The Nissan rotated onto its right side and continued until its roof struck a concrete support column, coming to rest on its right side wedged between the guardrail and the support column." San Diego firefighters removed the roof and left-side doors of the Versa to reach the crash victims inside. 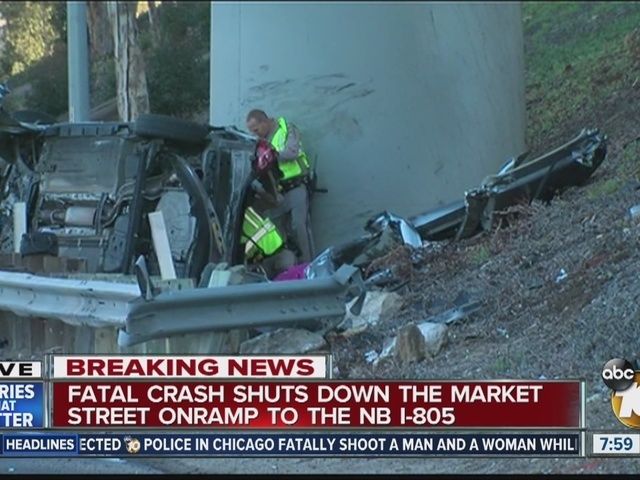 The two right lanes of I-805 northbound and the Market Street off-ramp were closed following the crash until 9:15 a.m.